Curated by Dr. Alicia Barber, this exhibit, launched in honor of Reno’s sesquicentennial, comprised all five floors of the Mathewson-IGT Knowledge Center at the University of Nevada, Reno for a full year. The exhibit combined photography, maps, historical objects including showgirl costumes and neon signs, books, memorabilia, and more to celebrate Reno’s rich 150-year history. Thematic areas focused on the city’s natural landscape and built environment, communities and cultures, industries, tourism, transportation networks, the University of Nevada, architectural visions of Reno’s future, and more. The creative team also included Donnelyn Curtis, Chris Holloman, and Jill Stockton of UNR Libraries, and Peggy McDonald. More information on the exhibit can be found here. Our role: Exhibit conception, research, selection of imagery and objects, writing of all exhibit text, collaboration on graphic and other exhibit design elements, public programming. 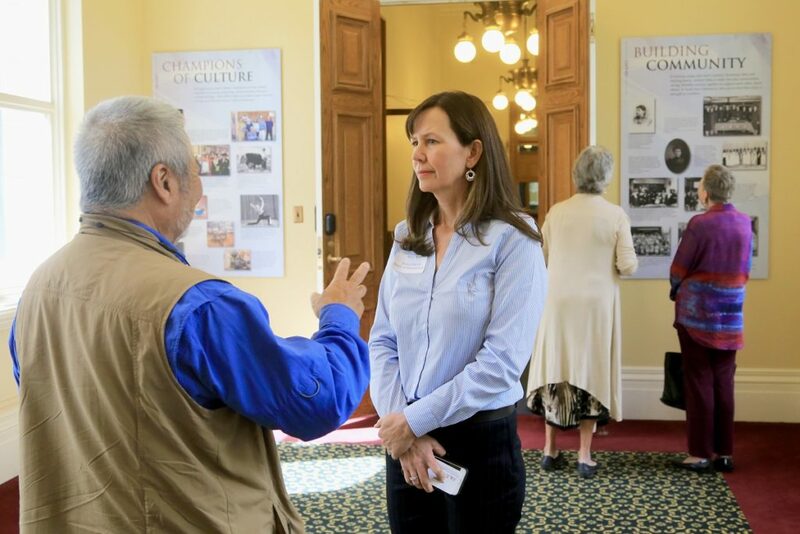 The Nevada Commission for Women hired us to conceptualize, research, write, and design this permanent exhibit for the second floor of the Nevada State Capitol Building. The installation highlights contributions of Nevada women in six thematic areas, each explored through an interpretive panel combining imagery and text: Forces at Work, Champions of Culture, Taking a Stand, Building Community, Political Powerhouses, and Breaking Barriers. Curator Alicia Barber, PhD, of Stories in Place reached out to communities throughout the state to assist in the selection of individual women, groups, and organizations to feature. The installation was launched in September 2018. Graphic Design by Lori Kunder Design Studio. Funding provided by Kathleen and Ernest Becker, Caesars Foundation, National Endowment for the Humanities, Nevada 150 Foundation, and Nevada Humanities. Our role: Conception, research and writing of display text, community outreach, locating and securing high-resolution images, usage permissions, hiring and management of graphic designer and fabricator/installer. 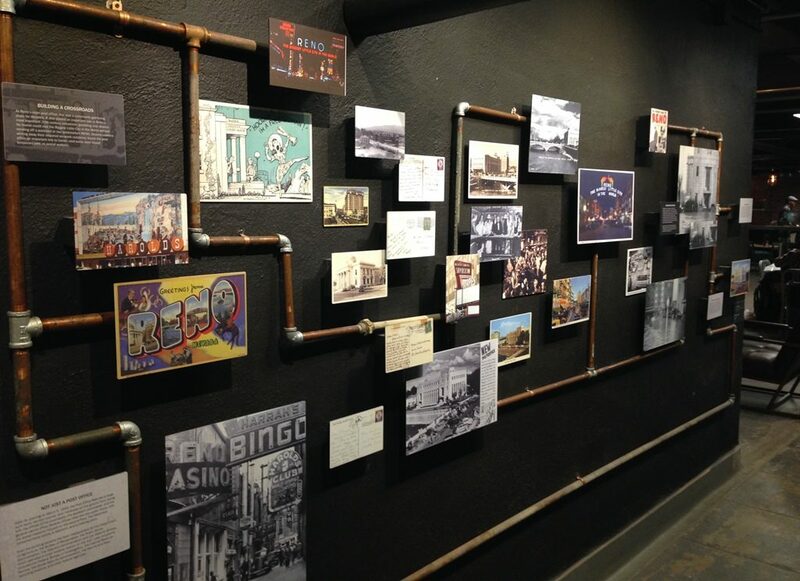 We were approached by lead designer Brianna Bullentini to assist in the creation of a permanent history installation for The Basement, a marketplace and food destination located in the basement of the historic 1934 downtown Reno post office, which was designed by prominent Nevada architect Frederic DeLongchamps. The building was sold by the U.S. Post Office and has been re-purposed as commercial and office space under the name 50 South Virginia. Working collaboratively with an existing design team, we helped to determine the scope of the display, researching and developing content about the history of the building, Reno in the thirties, the role of the post office in the city’s gamblign and divorce industries, and Frederic DeLongchamps. Bullentini conceived of a plan to mount the photographs, postcards, and architectural plans on reclaimed pipes to complement the industrial feel of The Basement’s overall design. Our role: Research and writing of display text, locating and securing high-resolution images, and usage permissions. 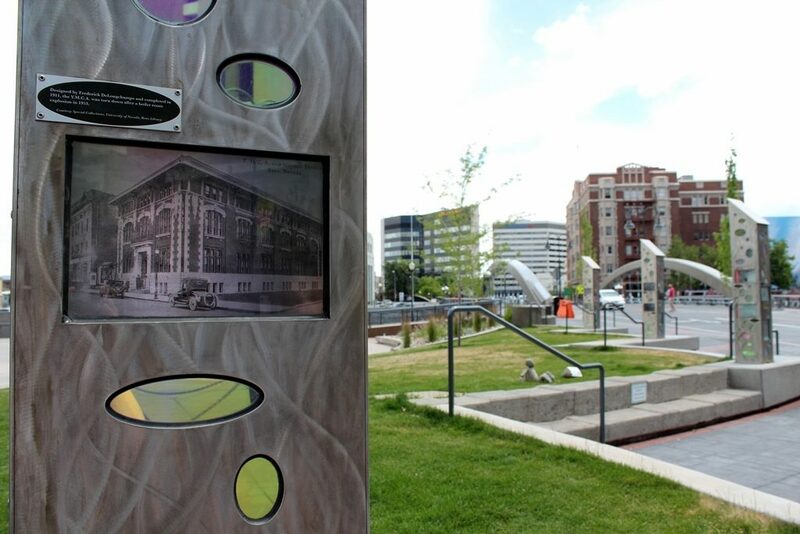 We conceived, researched, and designed two permanent historical displays for the interior of RTC 4TH STREET STATION in downtown Reno (East 4th and Lake Streets) and RTC CENTENNIAL PLAZA in Sparks (Victorian Avenue at 15th Street). 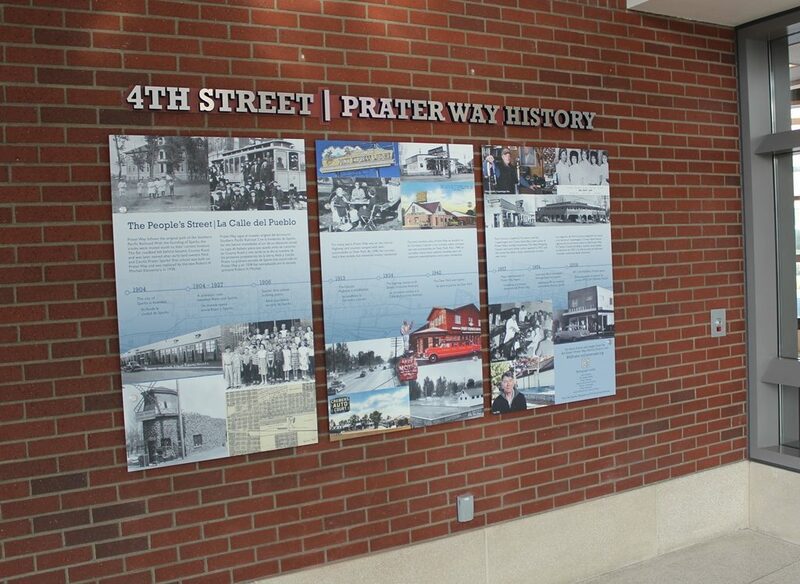 Each display is distinct, and features historical photographs, maps, and postcards; a historical timeline; and selected portraits of participants in the 4th Street-Prater Way Oral History Project. The displays’ design is intended to complement the clean modern architecture of the two transit stations. Our role: Concept through installation: hiring & directing graphic designer; researching and writing content; securing images; coordination of fabrication and installation. Titled UnBuilt Reno: Alternative Architectural Landscapes, this exhibition included architectural drawings, sketches, digital renderings, and scaled models of residential, commercial, and public projects from 1926 to 2008, including previous proposals for various riverfront development projects and innovative designs for area residences. 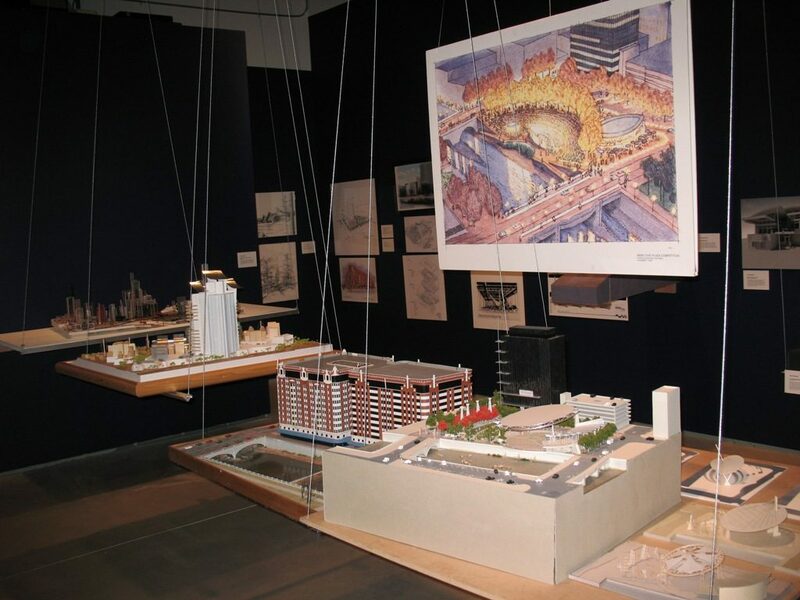 UnBuilt Reno was exhibited in the Media Gallery of the Nevada Museum of Art from March 29 through July 6, 2008. Our role: Overall curation and coordination, development of all display text. This permanent installation at 10 N. Virginia Street in Reno was a collaboration with San Francisco artist Cork Marcheschi. The series of six columnar sculptures, designed by Marcheschi, each features a geographical location or theme relating to Reno’s past. Standing on the former site of Reno’s venerable Mapes Hotel and Casino, which was imploded amid much controversy in 2000, the piece is intended to serve as a place of healing and historical memory for residents and visitors alike. It was dedicated in 2006. Looking southwest across the installation site, the historic Riverside Hotel can be seen on the opposite bank of the Truckee River, just past the new Virginia Street Bridge that was dedicated in 2016. Our role: Research of historical material, development of all text, securing high resolution images and usage permissions.